War is coming to Collinsport, one of those big mythological ones where everybody dies, and it takes a couple centuries before you figure out it was all a metaphor for something else. The big dance is going to kick off next week, so this week is about defining who the main combatants are. Yesterday, we were introduced to “the dead”, who are running on the incoherent but passionately expressed platform that you have disturbed my rest, my rest has been disturbed, you must be punished for disturbing my rest, and so on. Don’t worry about following that line of reasoning too closely; you don’t need to understand it. It’s a “the dead” thing. Today, we’re going to take a look at Angelique, another major player in the saga, and we’ll ask: Where do her powers come from, anyway? I mean, it’s funny the things that occur to you when you’re watching somebody get kidnapped by a walking corpse and deposited in his empty grave. By this point, Dark Shadows has traveled so far past the sanity horizon that it’s only at moments like this that you step back, and say to yourself, wait — how did Angelique get her hands on the secret magic number of the universe? Because that’s the only possible explanation for what we’ve been looking at for the last six weeks. Back in 1967, just before the 1795 storyline started, Barnabas told Carolyn about a warlock he met in Barbados. Barnabas: The gods told him the secret magic number of the universe, the number which unlocks all the rules that bind you mortals to your daily, dull lives. Now, if you were in Barbados for spring break, and somebody told you that he knew the secret magic number of the universe, you’d want to know what it was, right? After you bought the weed, I mean. So that must be what happened to Angelique, too; she must have had a year abroad or something. Because she has a fairly wide range of magic powers at her disposal — love potions, remote viewing, raising the dead, turning people into cats, pretty much the whole deluxe plot point package. Last week, Angelique told Abigail that she learned about herbs from her mother, but if that’s where she learned all of this stuff, it must have been a fairly intense home-schooling curriculum. But even with all of her powers, Angelique can’t make a soap opera wedding happen on schedule. 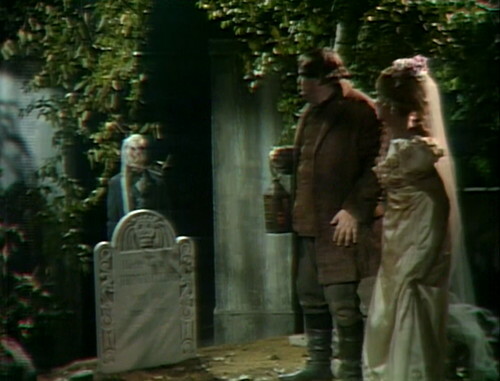 She’s been carried off by the dead, so Barnabas has to stand around and make empty apologies to Reverend Bland. Yes, that’s his name; it’s in the credits and everything. Rev. Bland: Mr. Collins, I demand an explanation! Rev. Bland: Well, your man — he rushed out! 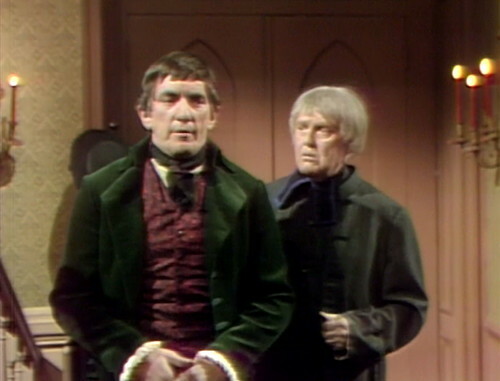 Barnabas: There is no explanation for what goes on here, Reverend. Yeah, you’re telling me. Look at the Reverend’s little baffled face. It’s adorable. He used to live in a world that made sense. Then he stepped onto Collins property. Meanwhile, Angelique’s encounter with Jeremiah’s spirit has inspired an Ebenezer Scrooge-type personal epiphany. Angelique: Oh, Ben — I’m going to change! I’m going to be different! I’m not ever going to make anybody unhappy again! Don’t get too excited about this; remember, it’s Angelique. When she says “I’m going to change,” she mostly means her outfit. But Jeremiah’s ghost is still being a jerk. He yells, “You cannot escape, ever!” and then he just laughs and laughs. That’s the nice thing about Jeremiah. Even dead, he knows how to have a good time. And he’s not done with the wedding destroyer routine. While Angelique changes out of her dirty dress, Jeremiah’s downstairs, knocking over furniture and generally making a nuisance of himself. Reverend Bland frets, accurately, that maybe this isn’t a good night for a wedding. But Barnabas insists, and apparently Bland was born without a spine, so we might as well dust off the organ, and bring on the bride. After all that, the wedding ceremony itself actually goes smoothly. 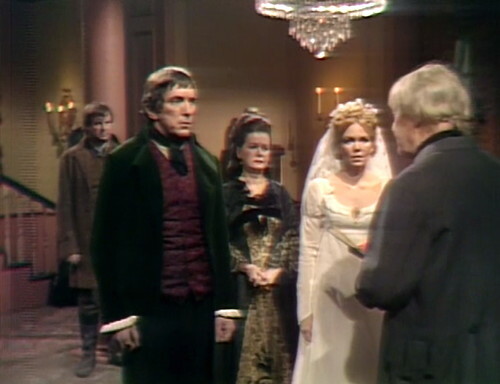 Barnabas’ mom shows up, Ben is the best man, and everyone says “I do” on cue. “What God has joined together,” the Reverend says, “let no man put asunder.” But he’s probably being sarcastic; I don’t think God got involved in this one. This was one of those weddings that slip through under God’s radar. But Jeremiah still has some pranks left over. 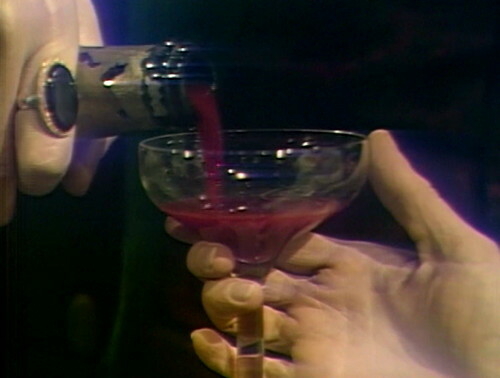 Barnabas tries to toast the wedding with a bottle of champagne, but it comes out red and goopy. Which is perfect. 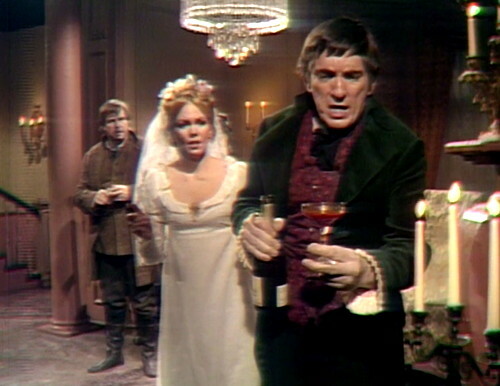 They really know how to throw a party on Dark Shadows. Angelique retires to the master bedroom, and she finds a familiar music box playing on the dresser. It’s Josette’s music box, which is supposed to be an important element of Barnabas and Josette’s romantic past, although this is the first time we’ve actually seen it in 1795. Angelique somehow intuits that this is a present for Josette, and she gets super cranky about it. She shouts, “You love her! You love her still!” which pretty much puts the kibosh on that whole “I’m never going to make anyone unhappy” resolution. You could see that one coming. Then Jeremiah’s ghost turns up again, because it’s been fifteen seconds since the last crazy thing. Angelique raises her hand, looks him in the eye, and says something very strange. Angelique: With every power I have, I call upon Beelzebub to take you back — back to the Earth of which you are a part! Back to await his judgement! We’re calling on Beelzebub now? Cause that comes out of pretty much nowhere. If you’re not up on your demonology, Ba‘al Zəbûb is the Lord of the Flies, Lucifer’s right-hand man. The name first appears in the Old Testament, in the second Book of Kings, where it refers to a Philistine god. Then it was picked up by Mark in the New Testament, who used it as another name for the Devil. By the 17th century, the name Beelzebub was used in classic New Testament fan fiction like The Pilgrim’s Progress and Paradise Lost as the second-ranking of the fallen angels, Lucifer’s lieutenant. So I guess that’s where Angelique gets her powers from, some kind of vague compact with the Lord of the Flies. I’m not convinced that Beelzebub would have signed off on something like this — investing unearthly powers in a girl just so she could trick a guy into marrying her — but maybe he’s not into micromanaging his staff. The really weird thing is that she’s standing there, telling Jeremiah to go back to his grave and rest, which is exactly what he’s been asking for this whole time. It’s like, okay, dude. Permission to go ashore. Go on, scoot. What’s the matter with you? Maybe what he really wanted was an invitation to the wedding. That’s the only explanation I can come up with. Tomorrow: No Rest for the Wicked. Ben finds Angelique in the cemetery, after she’s dug her way out of Jeremiah’s grave. Her dress is dirty, but her face and hands are perfectly clean, and her hair is still in place. When Jeremiah’s ghost chases off Ben and Angelique, he stumbles a little. He reaches out to steady himself by holding onto the gravestone, which wobbles. Barnabas snatches the music box away from Angelique, and leaves the room in a huff, slamming the double doors behind him. One of the doors bounces open again, and he has to reach back through the doorway to slam it closed again. A moment later, the doors open to reveal Jeremiah’s ghost standing in the doorway, and one door starts to swing shut again. A stagehand reaches out from behind a curtain to grab the errant door. This episode is the first appearance of Josette’s music box in the 1795 storyline; it was last seen months ago, in August. 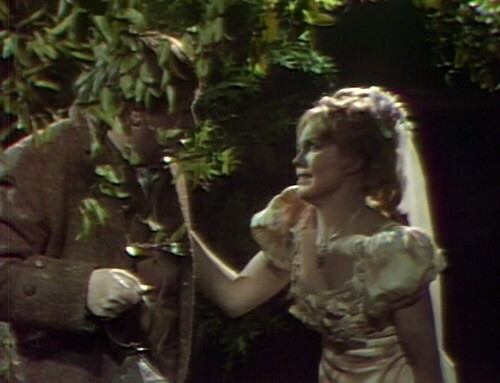 The music box was a huge part of the 1967 Barnabas / Maggie / Vicki story, so it’s funny that it took so long for them to introduce it once we had Barnabas and Josette on screen. My interpretation: They forgot all about it. 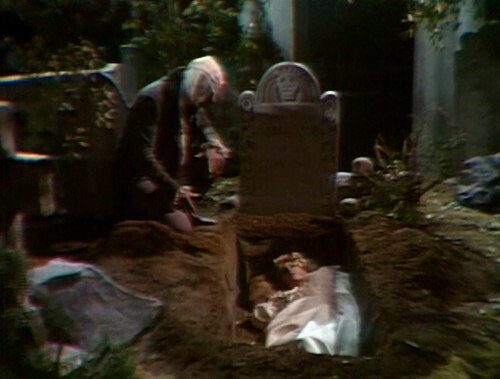 This is the last appearance of Jeremiah’s ghost in the 1795 storyline. He fades into the background here, despite his insistence that he won’t rest until he punishes Angelique. We’ll see him again, briefly, in 1968. Timothy Gordon, the fill-in actor playing dead Jeremiah, will be back in a couple weeks as a stand-in for Riggs, a Collins servant that we saw in December. This is Paul Kirk Giles‘ third episode playing 1795 ministers. Giles will return to the show in 1970, playing a Judge in 7 episodes of the 1840 storyline. 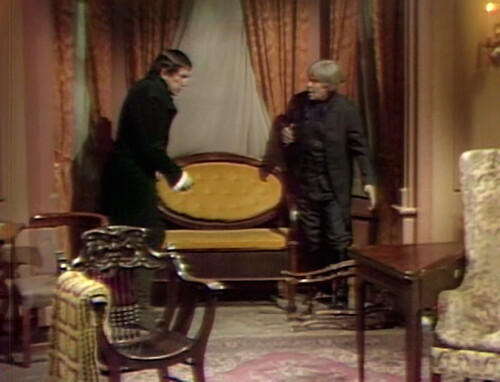 Isn’t there a blooper in the last scene, between Barnabas leaving the room and Jeremiah appearing in the doorway, where Angelique doesn’t open the door wide enough, and a stage hand’s hand is seen opening the door wider? 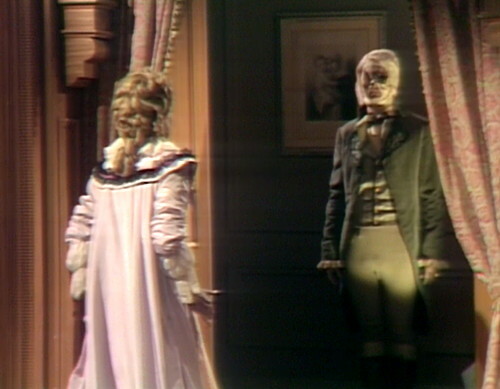 That whole Barnabas Barbados disappearing act was problematic, even by Dark Shadows standards. All of the trickery performed by Angelique in 1795 can pretty much be attributed to her. But when did Barnabas become a ‘wizard of the dark arts’? It had to have been prior to the events of 1795 Collinsport. Logically it may appear that while Barnabas was in Martinique he may have made a ‘side trip’ to Barbados with or without Angelique. Since he appeared totally ignorant of the supernatural events happening around him in 1795, when could he have learned to perform his mystical disappearing act in front of 1967 Carolyn? Also what was the purpose of the disappearing act – he supposedly could already turn into a bat to teleport into Julia’s room if he wanted too. Yeah, Barnabas learning about the dark arts was another backstory element sacrificed when they decided to go back to 1795. This whole storyline is a retcon that completely rewrites almost everything that Barnabas ever said about his past. But this retcon is a lot more interesting than the original backstory, so we’re happy to accept it as the new truth. I think the point of the “secret magic number” ritual in episode 358 was to allow him to appear to Julia as Dr. Woodard’s ghost. I still maintain Barnabas was a big, fat liar. Well, we all know that the secret number of the Universe is 42. Yes – I forgot about Woodard’s ghost. I guess it was more difficult for me to try and write that incident off as part of the retcon since was something that actually happened on-screen before our eyes as opposed to Barnabas verbally telling a false version of events and then showing the viewer on-screen how they really happened. It’s also strange she has TWO white dresses or that she gets married in one because that’s more of a late 19th century and especially 20th century tradition. I’m a little confused on the issue of the “original” Josette’s music box theme and this being a new one. The music in this episode sounds pretty much the same to me. Did they go back and retroactively replace the earlier episodes’ tracks for this music in the MCI video releases? Or perhaps the “new” theme just sounds very similar to the “old” theme? I think the two versions of Josette’s theme sound similar, but there are differences. I think Farnon would have a case for plagiarism. I’m disappointed because I always thought that both versions were Cobert’s. Barbados was a historically important British trading port in the later 1600’s. Initially, the labor in 13 (US) colonies was provided by indentured servants, but eventually, Barbados switched to slave labor, unfortunately leading the way for the same in the British colonies in North America. When Barnabas turned into a vampire he got access to what he had learned and forgotten. Perhaps it even helped him deal with his imprisonment in the coffin. I think it’s also possible the shaman set things in motion for Angelique’s obsession with Barnabas. Angelique, more than any other DS character, evinces the illogical and foolish behavior of a person under a magical compulsion. Maybe Angelique fit some magical profile and the shaman wanted a woman with that profile to pair up with Barnabas. Or maybe, something the shaman did just snagged the wrong witch. I do also agree that Barnabas is a liar at times, but not in the case of learning magic in Barbados. I’ve never heard Paradise Lost described as “New Testament fan fiction.” One of the more hilarious remarks on this blog (and it has stiff competition). What I wouldn’t give to go back to undergrad and insert that into the Milton paper. Just to see if the professor was paying attention to sophomore drivel. Not to spoil things, but Jeremiah’s ghost says that he is not under Angelique’s power. She wants to know who the hell’s power he is under. Surely Angelique does not believe it could be Vicki’s power. That would mean believing that Vicki really is a witch rather than just a patsy. I guess that since Jeremiah is gone for a long time after this episode that this “other necromancer” plot point will be dropped. We shall see. I haven’t seen this since 1968, so it is not all coming back to me.